It remains understandable Randle would feel that way. But it still sounded amusing. After all, Randle had just completed a 2 1/2 hour practice filled with conditioning drills, shooting exercises and scrimmaging. The Lakers would then have a two-hour evening session. Who would have thought Randle would relish such physical torture? HONOLULU — Just as nearly everyone here slept comfortably in their beds, Kobe Bryant woke up to prepare for something that has consumed him nearly his entire life. He woke up at an ungodly hour for an individual workout to strengthen his body, most notably the surgically repaired right shoulder he has rehabbed in the past eight months. 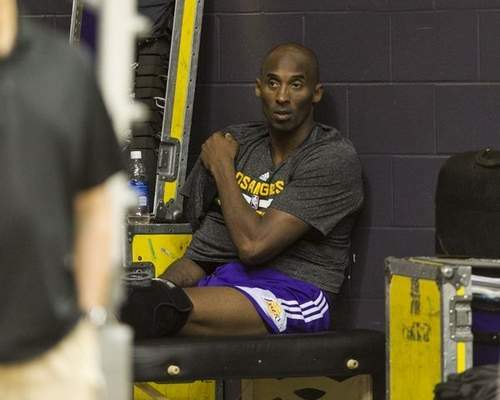 Bryant then arrived to practice early for an individual shooting workout to accelerate his rhythm. The Lakers’ star then participated in most of the Lakers’ 2 1/2 hour practice that started at 11 a.m, which consisted of full-court 5-on-0 and 5-on-5 drills. 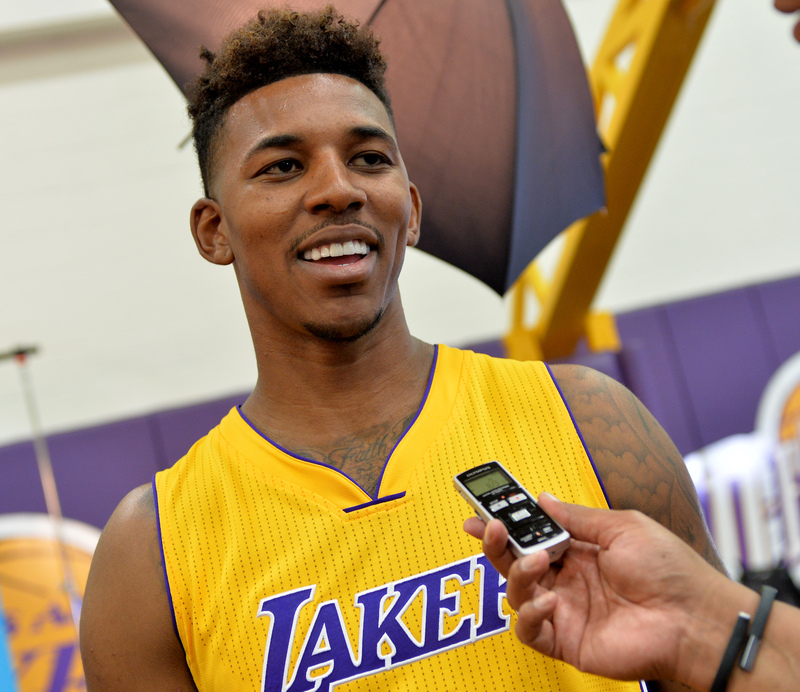 So many things happened that made Nick Young’s normally infectious smile turn into a frown. The Lakers finished 21-61 last season in what marked their worst record in franchise history. Young shot only 36.6 percent from the field, his worst mark in his eight-year NBA career. He missed the last two months of the season because of fractured left knee. Through it all, Young clashed with Lakers coach Byron Scott amid his role, his inconsistency, his tardiness to games and for an infamous post-game celebration. Once it all ended, the Lakers tried trading Young this summer only to find uninterested suitors. But Young reported to the Lakers’ training camp still bearing the same smile, vowing that he will write a script that entails a happier ending. HONOULU — The exercised involved a simple three-man drill, but Lakers rookie guard D’Angelo Russell struggled to process it all. The drill itself is simple and elementary for any basketball team, let alone the Lakers. But what left Russell pinching himself on his first day of Lakers’ training camp here at Stan Sheriff Center entailed who also completed the drill. His name is Kobe Bryant. He is entering his 20th and perhaps final NBA season. And when Bryant made his preseason debut here on Oct. 10, 1996, Russell had only turned 221 days old. HONOLULU — The nostalgia struck Kobe Bryant and Byron Scott, their return trip here to Stan Sheriff Center sparking memories that seem so long ago. Scott began his last NBA season 19 years ago at training camp here at the same time Bryant entered the league, the player-mentor relationship eventually morphing to a coach-player partnership. Scott and Bryant experienced this moment many times. The late Lakers owner Jerry Buss began this tradition in 1988, which morphed into the Lakers going here for eight of the nine next NBA exhibition seasons. Scott appeared in five of those training camps from 1988-1990, 1992 and 1996, viewing them as a refuge from the ordinary. HONOLULU — The players lined up on one side of the court, waiting for Lakers coach Byron Scott to blow his whistle to signal the beginning of yet another arduous exercise. Then it happened, the shriek of Scott’s whistle prompting all of his players to run up and down the court. Lakers guard Jordan Clarkson finished the drills first, prompting Scott to say “the kid seems like he can run all day.” Lakers guard Kobe Bryant sat on a trainer’s table, but Scott reported Bryant “remained ahead of the pack” in conditioning drills he participated before the Lakers permitted reporters to view practice. And then there was Lakers rookie guard D’Angelo Russell, who completed the drills adequately before admitting afterwards he hardly enjoyed them. 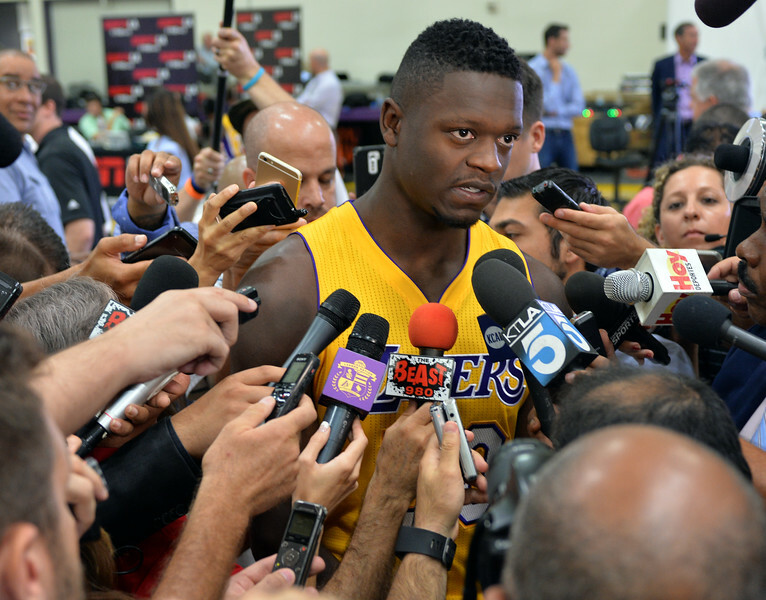 Los Angeles Lakers Media Day in El Segundo Monday September 28, 2015. Roy Hibbert interview. All the numbers suggest the NBA teams should go small, the influx of speedy point guards and outside shooters forcing the game to put less of an emphasis on size and power. 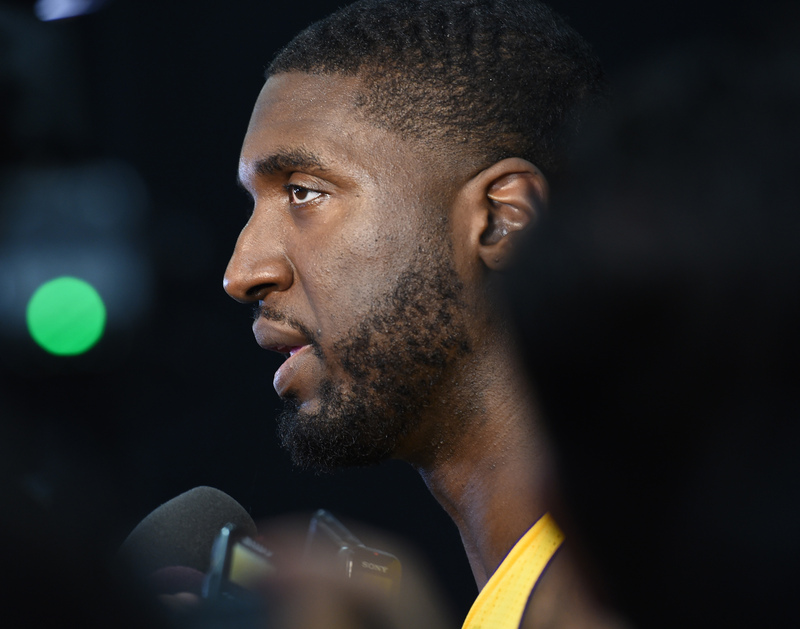 But to break that trend, Lakers center Roy Hibbert wants to take advantage of another number. His weight. Hibbert spent a significant chunk of his offseason losing 15 pounds in fat, so he would no longer become seen as a plodding big man. One of those centers includes Golden State’s Andrew Bogut, whose contributions Hibbert believes quickly became overshadowed with the outside shooting from Stephen Curry and Klay Thompson’s emergence as well as the defense from Andre Iguodala and Draymond Green. Yet, the 7-foot Bogut still landed on the NBA’s All-Defensive Second Team and finished sixth in Defensive Player of the Year votes despite averaging a career-low 23.6 minutes per game. After only completing a string of exhibition games, Julius Randle heard some life-altering feedback that Kobe Bryant delivered with brutal honesty. “If you [bleep] this up, you’re a really big idiot,” Bryant told Randle. Mere moments after stepping on the practice court, Jordan Clarkson wound up defending Bryant and soon experienced the scorn most defenders experience after the Lakers’ star scores on them. “Don’t hurt yourself young fella,” Bryant said to Clarkson after sinking a mid-range jumper over him. Both Randle and Clarkson still have limited perspective playing with Bryant. Randle played only 14 minutes in the NBA season opener last year before fracturing his right tibia and missing the rest of his rookie season.Clarkson did not become the Lakers’ starting point guard until Bryant needed season-ending surgery on his right shoulder after playing 35 games. But both players offered perspective on what the Lakers’ other crop of young players will need to do to absorb Bryant’s stern leadership style. 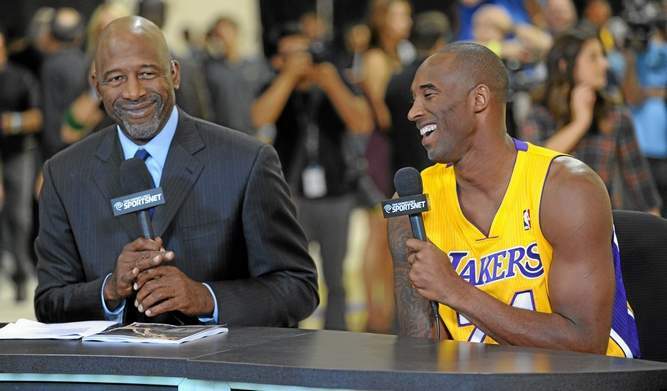 The man provided a commanding presence, James Worthy’s dapper suit, friendly personality and Hall of Fame resume attracting plenty of reporters, Lakers officials and players alike to chat with the former Showtime Laker. Worthy appeared at the Lakers’ practice facility for the team’s media day on Monday as an analyst for Time Warner Cable SportsNet, but it turns out his role will become more involved for the 2015-16 season. The Lakers hired Worthy to work with Byron Scott’s coaching staff, mainly to develop the team’s core of frontcourt players in Julius Randle, Roy Hibbert, Brandon Bass, Larry Nance Jr. and Tarik Black. The reasons appear pretty self-explanatory after Worthy won three NBA championships with the Showtime Lakers during his 12-year NBA career and being named as one of the 50 Greatest Players in NBA history. Everyone watched Kobe Bryant’s every movement. 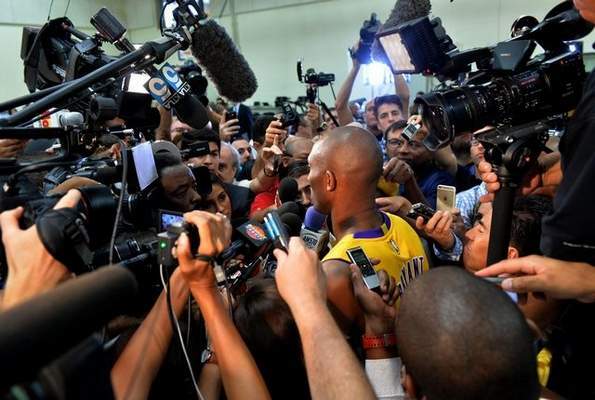 The Lakers’ star attracted mob-like attention as he walked around the Lakers’ practice facility to film endless promotional spots and conduct endless interviews on Monday at the team’s annual Media Day. Each step Bryant takes on the court in the 2015-16 NBA season could cause the same frenzy. He enters his 20th NBA season that pays him $25 million, and the intrigue goes beyond whether he can stay healthy after his season ended abruptly for three consecutive years because of ailing injuries. The debate will linger on if this will mark Bryant’s last NBA season. All of which led the Lakers’ star to express uncertainty in blunt terms. Bryant spoke those words without any hint of sarcasm or vagueness. The Lakers’ star maintained he has no idea what to expect on how well he and his teammates play, let alone whether he wants to prolong his NBA career. The conventional wisdom suggests Bryant’s future will hinge on if he can stay healthy and how quickly the Lakers’ core of young players develop, two variables that will determine the length of the franchise’s current rebuilding project. But Bryant suggested other unforseen circumstances could emerge influence his thinking.